The new Global Vertical Cabling Section is a cost-effective, adaptable vertical cable management solution with a unique, two-piece design that significantly reduces shipping size and cost. The two parts can be quickly assembled and then bolted to CPI's Universal and Standard racks as well as QuadraRack frames. It ships preassembled with patented cable guide fingers at 1 RMU intervals for you to easily and neatly organize cable. Each section includes a two-piece section, a door/cover and mounting hardware. Additional cable management can be achieved by placing sections back-to-back, creating a double-sided solution, or by adding a low-cost set of seven cable management rings in the rear (sold separately, see below). A wide variety of solutions for cabinets and racks. All CPI Cabinets provide integrated vertical cable management space inside the enclosure. Chatsworth Products, Inc. (CPI) is pleased to announce the Global Vertical Cabling Section, a cost-effective, adaptable vertical cable management solution. The unique, two-piece design of the 7' aluminum, one-sided section significantly reduces shipping size and cost to provide maximum value while retaining the high-quality workmanship common to all CPI products. The two parts can be quickly assembled and then bolted to CPI's Universal and Standard racks as well as QuadraRack frames. The Global Vertical Cabling Section comes preassembled with patented cable guide fingers at 1 RMU intervals for you to easily and neatly organize cable. The fingers are made of durable, flameretardant (UL 94V-0) plastic to withstand wear-and-tear and prevent accidental breakage. Choose between two sizes of cable guide fingers: standard 3.21" depth or extended 5.75" depth for more cable capacity, achieving a total depth of 6.76" and 9.30" respectively. The product also includes an aluminum, snap-on, hinged door/cover to easily hide cable for a professional look. At the same time, it swings on hinges to open left or right, allowing quick access to the cable from either direction for easy moves, adds and changes. The door/cover sits on top of the cable guide fingers to provide additional room for organizing. Improved CPI hardware makes the Global Vertical Cabling Section easier to install and maintain. CPI provides rounded acorn nuts for attaching the two section pieces together in order to eliminate sharp edges and reduce the chance of torn cables and injuries. For mounting the product to the rack, square carriage bolts - instead of standard round bolts - are provided, allowing tightening of the nuts with just one hand. The Global Vertical Cabling Section includes a two-piece section, a door/cover and mounting hardware. Available in two widths (wide 6"W or narrow 3.65"W) and two depths (6.76"D with standard fingers or 9.30"D with extended fingers), so you can best accommodate your cable. Should you require additional cable management capabilities, you can modify the product to fit your budget and needs. Create a double-sided unit by placing sections back-to-back, or add a low-cost set of seven cable management rings in the rear (see Accessories information on the back page of this sheet). Additional accessories, such as fiber management spools, will be made available in the near future. Two-piece design reduces the product's shipping size and cost. Patented cable guide fingers at 1 RMU intervals provide an organized pathway for cable and patch cords. Snap-on, hinged door/cover hides cable for a finished appearance yet allows quick access to cable for making changes. Acorn nuts eliminate sharp edges, reducing injuries and torn cables. Carriage bolts ease installation by allowing tightening with just one hand. Choice of widths and depths lets you pick the best product for your cable management needs. Low-cost accessories allow you to create a double-sided unit for additional cable management in the rear. Choose a wide or narrow section with either standard- or extended-finger depth. (Wide with standard fingers and narrow with extended fingers shown to right.) All selections include a two-piece section, a door/cover and mounting hardware. Purchase accessories for the Global Vertical Cabling Section to grow with or adapt to your changing needs. A set of seven Cable Rings can be attached to the back of the product to organize rear wires for a neat, professional installation. The rings provide the functionality of a double-sided cable management system -- at considerable savings. CPI’s new Velocity™ Cable Management provides an economical solution that is easy to install, easy to transport and offers more capacity and simplified cable management. Available in single and double-sided vertical and single-sided horizontal configurations, Velocity creates a complete pathway for premise cabling and patch cords, supplying comprehensive cable management solutions for open two- and four-post Rack Systems. CPI Evolution™ Cable Management provides an engineered solution for managing high-density cabling applications on open two-post and four-post CPI Rack Systems, delivering increased performance to match the demands of data center applications. Featuring easy-to-use doors with styling that complements the CPI TeraFrame™ Family of Cabinets; Evolution™ Cable Management provides innovative interior features to help maximize the capacity and utility of vertical and horizontal cable management. Use vertical managers on the sides of racks to manage premise cables, patch cords and jumper cords. Vertical managers include plastic T-shaped cable guides with openings that align with each RMU space on the rack. Rounded edges on the cable guides and the top of the manager protect cables as they enter or exit the interior storage space. On double-sided managers, Movable Mid-Sections allow personalized placement of Cable Distribution Spools and other cable management accessories to effectively route patch cords. Use accessory Fiber Segregation Kits to create a dedicated internal channel for fiber cabling or accessory Cable Lashing Bar Kits to anchor premise cables closer to the mid-sections to increase capacity. The Movable Mid-Sections can also be positioned for a 50/50, 40/60 or 60/40 front/rear split of the internal cable management space to match cabling requirements. The door is secured by a spring-loaded two-point latch controlled by a single knob; simply turn the knob on the right or left side of the door and pull to swing the door open or turn both knobs to remove the door. The door attaches to the base and top of the cable manager, not the cable guides, and opens wider than previous designs for better access to cables. Vertical managers are available in single-sided and double-sided configurations in five widths and three heights to match cabling requirements. Use horizontal managers above and below patch panels and network switches to organize and store cables. Horizontal managers also include plastic T-shaped cable guides to organize patch cords and jumper cords as the cords enter and exit the manager to make individual equipment connections. The snap-on cover matches the door styling on the vertical manager. Swing the cover up or down to access cables; the cover stays in the open position while cabling. Horizontal managers are available in single-sided, 1 RMU, 2 RMU or 3 RMU high configurations for 19” EIA-310-D compliant equipment Rack and Cabinet Systems. Combine CPI Evolution Cable Management with two-post and four-post open Rack Systems to create a custom solution that fits your exact needs. CPI offers horizontal cable managers with varying options for cable support. Cable guides range from simple bars and trays to rings and patented fingers. 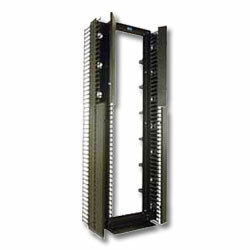 Horizontal managers can be used in racks and cabinets. CPI’s next generation F-Series TeraFrame™ Cabinet System has enhanced features that easily adapt to changing requirements and lets you configure a personalized solution that is delivered quickly to meet your busy schedule. The F-Series TeraFrame organizes, stores and secures computer, data storage and network equipment in the data center, computer room or network environment. Every cabinet includes two pairs of adjustable depth equipment mounting rails that slide front-to-rear to provide critical front and rear support for equipment. Square-punched EIA-310-D compliant equipment mounting rails (the industry standard) guarantee compatibility with most rackmount equipment. Plus, each RMU is marked and numbered on all mounting rails making it easy to locate and attach equipment. The top panel has large brush-covered cable openings that will handle large bundles of cables while preventing undesirable hot air re-circulation. Upgrade to the Vertical Exhaust Duct as cabinet heat loads increase. Side panels have recessed, locking, spring-loaded latches and can be easily removed from the outside to access equipment. Cabinets can be bayed with side panels installed or uninstalled. Doors and side panels are either solid or perforated (mesh). Mounting rails, top panel, side panels and doors are electrically bonded to the cabinet frame. Doors feature a swing handle for better security. There are seven latch styles to choose from. Combine the F-Series TeraFrame with thermal and cable management accessories to create a custom solution that fits your exact needs. The N-Series TeraFrame™ Network Cabinet provides an engineered solution for network switches and cabling in data centers with hot aisle/cold aisle layouts, delivering superior thermal management for high-density applications. Featuring offset doors and side panels, the N-Series TeraFrame Network Cabinet provides extra interior space around the cabinet frame for cable management and enhanced airflow. Select the Network Switch Exhaust Duct option when deploying network switches that require side-to-side airflow. The Network Switch Exhaust Duct, designed to support Cisco 6500 and 9500 series switches, isolates and re-directs hot exhaust air from the side to the rear of the cabinet to help prevent the re-circulation of hot air through equipment and establishes best-practices for a hot aisle/cold aisle layout. The N-Series TeraFrame Network Cabinet includes vertical cable guides and cable management spools to help organize cables. The guides are T-shaped with openings that align with each RMU space on the rack and attach to the front of the cabinet frame. The spools attach to the side of the cabinet frame and help guide cables along the side of the cabinet preventing them from accidentally blocking air intakes on switch chassis. Use the vertical cable guides and cable management spools to route cables to the right side of switches to maintain full access to the switch fan modules. Available in 10 heights and 11 depths, the N-Series TeraFrame Network Cabinet matches F-Series TeraFrame Cabinet System sizes. Each cabinet includes two pairs of 19" EIA equipment mounting rails to provide front and rear support for equipment and/or equipment shelves. Choose square-punched or tapped mounting rails. Mounting rails are RMU marked and numbered for exact placement of equipment. Each cabinet includes a top panel with knockout cable ports, a single perforated front door and perforated double rear doors. Both doors have a swing handle with a two-point latch with keyed or combination locks. Solid or vented locking side panels are optional. See inside for product details. Although cable runway can be attached directly to the top of a row of MegaFrame Cabinets to provide a pathway for horizontal cabling, it may not always be preferable to have cabling exposed above the cabinets. What if you could have a cable runway hidden from view inside the cabinet? CPI's NEW Horizontal Cable Tray does just that! The Tray is designed to complement the M-Series Cabinet's integrated vertical cable management rings. The tray has radius drops attached at either end to provide a smooth transition for cables entering and exiting the tray into the vertical ring managers. Like the vertical ring managers, the tray may be adjusted in depth. When several cabinets are used in a row, align the Cable Trays and create a cable pathway inside the cabinets. Trays are available for both 19" and 23" cabinets. Each tray is six-inch deep and two inches high. Each tray can support up to 50 pounds of cabling. Use two facing trays to create a 12" deep trough. Trays are finished in Gray, White, and Black to match the existing cabinet's finish. Click here to learn more about MegaFrame M-Series Cabinets. The new CPI Universal Horizontal Cable Management System provides an attractive and highly functional horizontal pathway for patch cords and multimedia applications using coax, copper and fiber optic cables. When used above or below patch panels, the extrawide, contoured plastic cable guides of the Universal Cable Manager create a pathway for neatly fanning the patch cords from the patch panels and routing them to the sides of the rack. Patch cords may also be routed to the back of the rack through the flanged pass-through slot. In multimedia applications, the Universal Cable Manager provides horizontal cable routing in or between racks. After routing the cables or cords, simply snap-on the hinged cover for a clean, professional appearance. The cover opens 180° in up or down position so that cables can be accessed without removing the cover (cover may be easily removed when required). Use in conjunction with the CPI Patch Panel Wire Management Bar (PN 12176-X01) and any of CPI's Vertical Cabling Sections (11374, 11729, 11730, 12096 series Vertical Cabling Sections or 30091, 30092, 30093*, 30094*, 30095*, 30096* series MCS™ Master Cabling Sections) for clean, organized cable management. Manage your horizontal cabling needs with the CPI Universal Horizontal Cable Manager—an attractive, highly functional solution in CPI Style. Provides a horizontal pathway for patch cords and multimedia applications using coax, copper and fiber optic cables. Extra-wide and contoured cable guides separate and organize patch cords for quick and easy Moves, Adds and Changes (MAC's). The cable guides are offset 1.3" or 2.6” from the front of the rack to ensure proper bending radii of patch cables—even hooded patch cables. Hinged snap-on cover opens 180° in up or down position and can be quickly removed for easy cable access. Cover attaches to cable manager with "snap on" clips at four points for sturdy, easy installation and removal. Cover and panel have a black powder coat wrinkle finish to reduce fingerprints, scratches and smudges.